Tagonoura Beach (田子の浦) is a beach located north of Suruga Bay, Shizuoka. It is popular view spot of Mt. Fuji and it appears in manyosyu, the oldest Japanese poetry. tagonourani uchiidetemireba shirotaeno fujinotakaneni yukiwafuritsutsu. 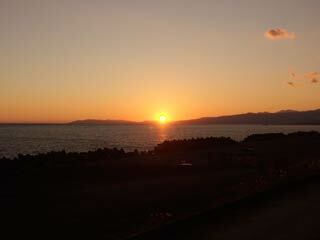 When I lived at Tagonoura beach, view was open to see Mt. Fuji, and I noticed that the top of Mt.Fuji was covered by snow.